The next issue of Literacy Lava will be published on March 1, 2010 (Australian Time). You'll find the link here at The Book Chook on that day, or you can access the archive of earlier issues right now on my website. 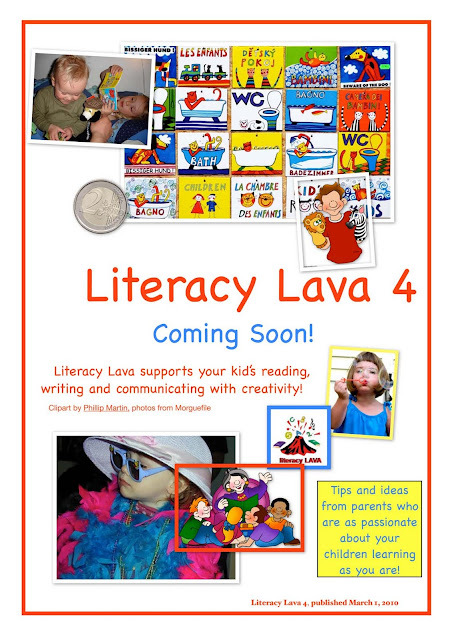 Literacy Lava is a free pdf brought to you by writers who are passionate about children's literacy. In this fourth edition, you’ll find ideas for nurturing creative thinking, ways to use magazines with your kids, ideas for raising book-loving boys, what to do if your child is not into writing, how to encourage your child to love reading, ways to promote inquisitiveness through hands-on learning, how to help kids make connections through story extensions, and all about helping kids to create stories through movie-making. Don’t forget to check out the Online Extras page, and the Activity page for kids. Literacy Lava 4, get it while it's HOT! Thank you for posting this. There are so many wonderful ideas that I can use in my classroom and also share with my parents. I haven't ever heard of Literacy Lava but now you have me excited! Kelly and Steph, I'm so pleased to introduce you to Literacy Lava. We try really hard to share ideas that parents can put in place in their everyday family life to encourage literacy skills in their kids. With contributors from varied backgrounds, there's hopefully something for everyone!